My birthday was two weeks ago, and, as is expected around one's birthday, a lot is on my mind about this little life of mine. I am trying to devote attention to slowing down. I have had starts and fits and successes and setbacks as I think about this concept. Oddly, the recent head cold has been both conducive to (I have had to spend a lot of time in bed this past week) and counter to (I find that the work piles up when you spend most of your evenings asleep on the couch) this idea of slowness. Further, such slowness often goes against what I think I want to do in the moment, but such slowness seems to be what I discover I really wanted upon those sweet, slow moments of reflection. How to slow down? How to breathe more? How to be not attached to an outcome? Such good questions. Okay, that was a little facile. However, I do mean it (wait for it--I will make the connection). *I am not kidding. Their plain, non-fat yogurt is so rich, so creamy, so tangy. I stand by this yogurt and go out of my way to buy it. The beginning of the caramel process. Waiting for the caramel to get toasty brown. This ice cream--the Salted Caramel*--is well known around these here parts. People not only come far and wide for the super soft,** frozen concoction, some even dress up as its likeness for Halloween. People are serious about this ice cream. As they should be. 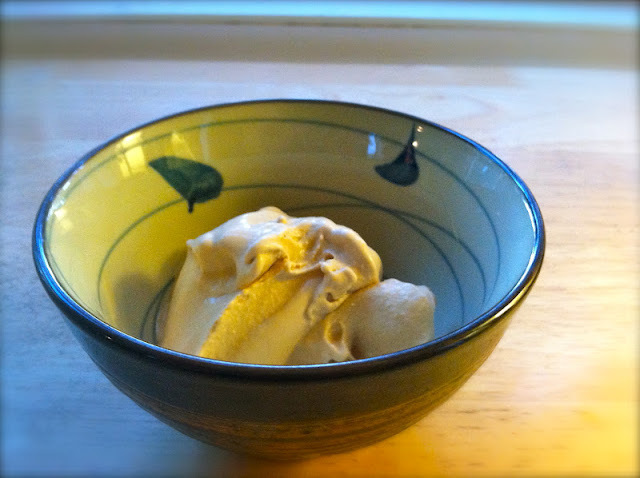 The process of making the whole ice cream is step intensive, and what goes into the ice cream maker is almost a custard, but the results are salty, smoky, a little bit bitter, sweet, decadent. In a word--transcendent. *This flavor is not on page 210 (see here if you are not sure why that matters), but it is the one we wanted to try the most. Another post will have to follow to see what we find on page 210. **This ice cream is a little on the soft side--there is a super-high sugar to milk fat ratio, so it is never going to be a hard ice cream. We couldn't resist eating it straight from the ice cream machine when it was quite soft. I am looking forward to tomorrow night's dinner after the ice cream has been in the freezer for 24 hours. And yes. I am eating ice cream for dinner. Don't judge. So how does this ice cream connect to my thoughts on slowness? 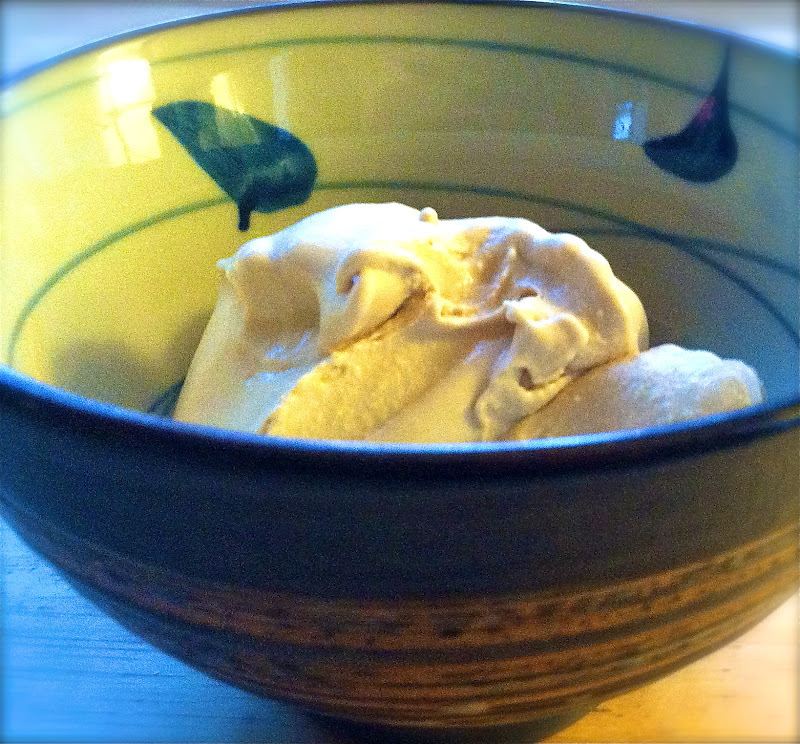 Well, what I love about cooking in general, but about this ice cream in specific, is that you cannot rush it. Yes, there are times when you need to work fast or be precise, but more importantly, there is a kind of soft, focused attention that must be paid in the home kitchen. * Soft because there is a slowness in the gathering of ingredients, the reading through a recipe a couple of times to get the sense of it, the fudging around the edges of the same recipe to make it truly yours in the moment, the waiting for things to heat or temper or chill. Focused in the measuring, the timing, the attention to detail. *In what appears to be a post devoted to the footnote, the aside, the taking the time to jump out of a paragraph, I will also admit that this is most certainly not the case in a commercial kitchen. And more often than not, such slowness has to be pushed aside in the domestic kitchen as well when the dinner hour is pressing and there are cranky, hungry mouths stridently calling for food. Look, it's autumn! I am beginning to buy apples. The dry caramel (oh, that smell of toasting sugar!) Generally, caramel can be a bone of contention for some, as you can truly vary the flavor of it by adding a few more minutes to cooking time. Bi-Rite calls for a dry caramel method, wherein you make the caramel without a water-base; you do need to be vigilant to not burn your sugar, but your attention to how dark you make your own caramel allows you to determine just how smoky or even slightly bitter you want your caramel to be. The initial cooling in the refrigerator. So today, in the midst of grading and prepping and thinking and reading and writing, I made ice cream. The husband did laundry, watered the grass, and pruned some bushes in the backyard. Then we had this for dinner--and given the caloric impact (try not to look at the amount of cream) and the incredibly rich base (ignore those egg yolks), that seemed to be just enough. It has been a needed and slow day. 1. Set the measured cream by the stove so it's at hand when you need it. Measure out 1/2 cup of the sugar and keep near the stove; you'll use this for the caramel (the rest will go in with the yolks). From the 1/2 cup, measure out 2 tablespoons of the sugar. Put 2 tablespoons in a heavy stainless steel pan over medium-high heat. 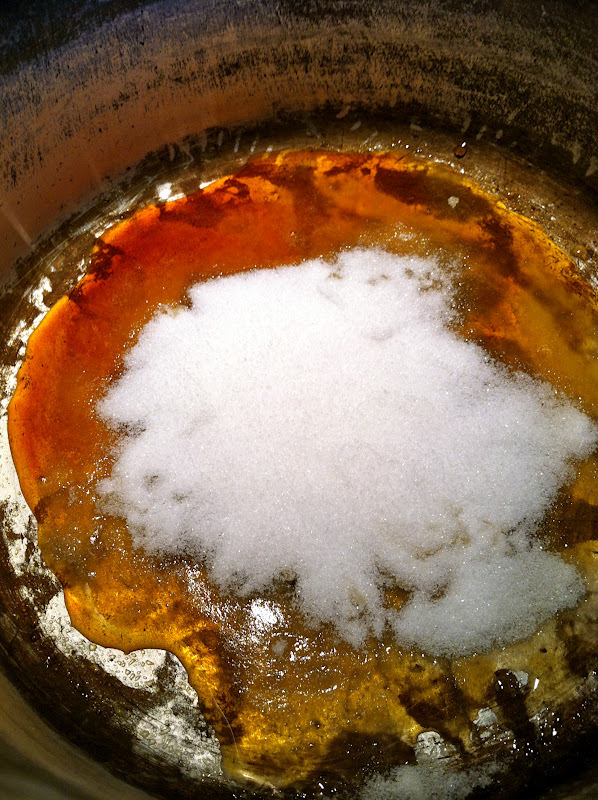 When the sugar is melted around the edges and starts to turn amber in places (about 2 minutes), stir the mixture gently and add another 2 tablespoons sugar to the pan. 2. Continue to add the rest of the 1/2 cup sugar, 2 tablespoons at a time, stirring frequently and allowing most of the sugar to melt before you add more. Watch carefully as the sugar darkens, stirring gently to help it melt evenly. 3. When the caramel becomes a dark mahogany color (for a rich, smoky flavor--you might want a lighter flavor), remove the pan from the heat and immediately pour the cream slowly into the pan. (It will steam and bubble up, so wear oven mitts and be very careful to avoid splatters and steam burns.) When the bubbling subsides, gently stir to blend the cream completely into the caramel. If you have lumps of hardened caramel in your pan, simply put the pan over low heat and stir until the caramel is melted. 4. 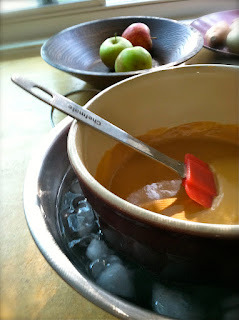 Once the caramel is completely smooth, stir in the milk along with the salt and put the pan over medium-high heat. When the mixture approaches a bare simmer, reduce the heat to medium. 5. 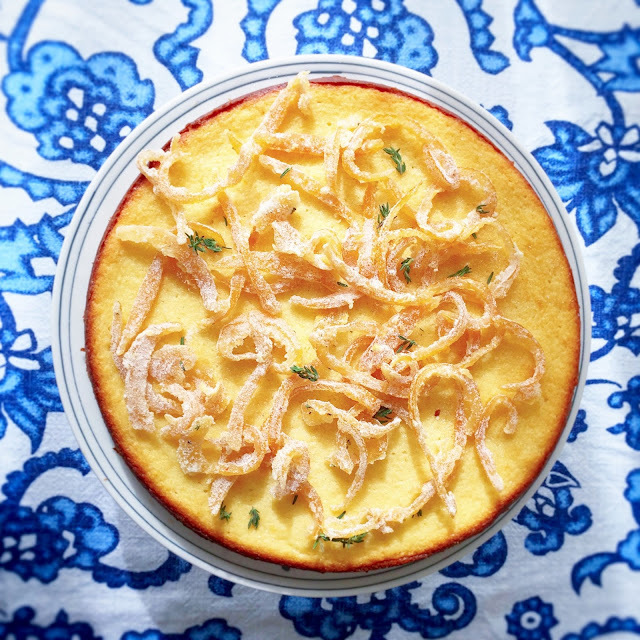 In a medium heatproof bowl, whisk the yolks just to break them up, then whisk in the remaining 1/4 cup sugar. Set aside. 6. Tempering: Carefully scoop out about 1/2 cup of the hot cream mixture and, whisking the eggs constantly, add the cream to the bowl with the egg yolks. Repeat, adding another 1/2 cup of the hot cream to the bowl with the yolks. Returning to the pan of cream on the stove, use a heatproof spatula to stir the cream as you slowly pour the egg and cream mixture from the bowl back into the pan. 7. Continue to cook the mixture carefully over medium heat, stirring constantly, until the mixture is thickened, coats the back of a spatula, and leaves a clear mark when you run your finger across it, 1 to 2 minutes longer. 8. Strain the base through a fine-mesh strainer and into a clean container. Set the container into an ice bath, wash your spatula, and use it to stir the base occasionally until it is cool. Then cover base with plastic wrap and refrigerate for at least 2 hours or overnight. 9. When the base is completely chilled, freeze in your ice cream machine according to the manufacturer's instructions. While the ice cream is churning, put the container you'll use to store the ice cream into the freezer. 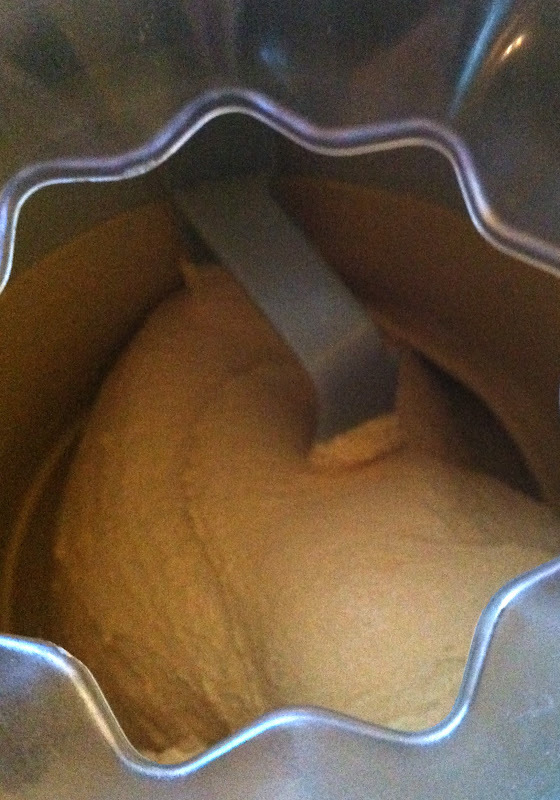 Enjoy right away, or for a firmer ice cream, freeze for at least 4 hours.